Before bringing home any fluffy and cute new household addition, some key details regarding the species' typical vocalization styles are pretty useful -- and smart. Although guinea pigs are relatively quiet creatures, they are usually a lot chattier than many animals in the smaller size group. In general, guinea pigs are not overly noisy pets. The Canadian Federation of Humane Societies reports that guinea pigs are actually quiet animals -- one of the reasons why they are such common and beloved household pets. Although guinea pigs usually aren't creating frustrating ruckuses, they certainly utilize vocalization for communication purposes -- just not often to the point that it's bothersome. Guinea pigs are especially communicative and expressive rodents. They usually will acknowledge your presence. If you enter into their immediate vicinity, they'll likely give you their own version of "hello," whether through squealing, whistling, squeaking, grunting or purring. Also, if they need something from you, they won't hesitate to let you know about it, either. A typical guinea pig "request" sounds kind of like a high-pitched "wheek." Guinea pigs crave close contact and rapport with their owners, which is why they share their feelings with them so often. If your guinea pig is in a good mood and all seems just dandy in her universe, she may be a little louder than usual. If she's anticipating you petting her or playing with her, she may produce a guttural grunting vocalization, or perhaps a whistling sound. If she's really excited about something, you may hear a whole cacophony of giddy guinea pig sounds -- think a lot of joyous whistles. 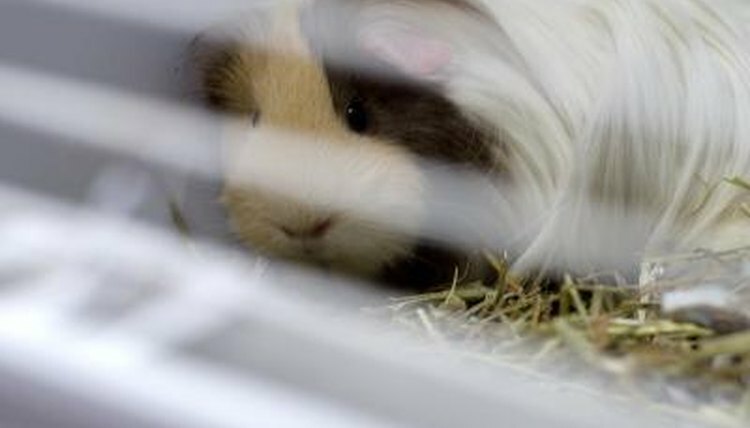 In these cases, a guinea pig may be pretty noisy, at least for a brief while. A variety of other vocalizations can also cause a guinea pig to be a wee bit noisier than usual. Some of these sounds include rumbling out of fear, hostility or social dominance, happy purring, mating-induced rumbling, chattering teeth out of frustration or irritation, painful shrieking and loving cooing. If a guinea pig wants to be, she can be just as loud as any other animal. It's just not her nature to be too noisy on a regular basis.